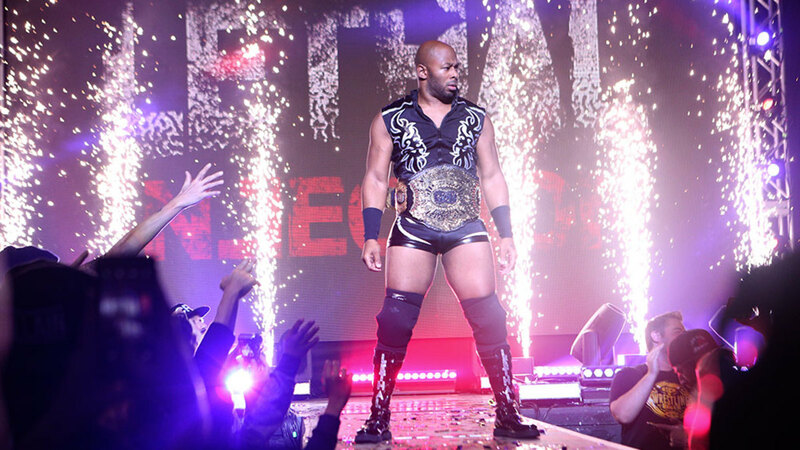 A recap of Jay Lethal destroying Matt Taven’s fake World title belt started off the episode. Marseglia and O’Ryan jumped their opponents at the bell, but PCO powered through them and Scurll used apron superkicks to get the early advantage. Marseglia and O’Ryan then cut off Scurll and used a double flapjack to start their attack. Inevitably, Scurll got the tag to PCO -- who got in and brushed off the attacks of The Kingdom. PCO used a pop-up powerbomb and a swing-out slam to nearly finish off Marseglia, but he only got a two count as O’Ryan broke up the pin. Scurll sent both Kingdom members to the floor and then launched PCO onto them. Scurll used a superplex and PCO came off the top with a frog splash, but Marseglia kicked out. Marseglia used a tilt-a-whirl side Russian leg sweep on Scurll but wasn’t able to secure the pin. The Kingdom took out PCO with a Marseglia dive and followed that up with a Red Rum senton on Scurll -- but again Scurll kicked out. After the break, The Kingdom were able to take out PCO as O’Ryan managed to hip toss him off the top turnbuckle onto a chair across the apron. PCO’s lower back snapped off the apron. This allowed O’Ryan to hit a moonsault on Scurll. It looked like PCO was out, but he made it back to his feet and took out O’Ryan. This left Scurll alone with Marseglia -- and he was able to latch on the chicken wing and Marseglia had to submit. Sumie Sakai was at ringside but didn’t get involved at all. An even exchange started off the match, but Holidead used a stunner and a leg drop on the apron to get the advantage. Iwatani used her quickness to evade and hit a single-leg dropkick. However, Holidead caught her and hit a big spinebuster to get a two count. Iwatani used a crucifix bomb, but Holidead kicked out at two. She then turned Iwatani inside out with a big clothesline. Holidead looked to finish off Iwatani with a double underhook powerbomb, but Iwatani landed on her feet and nailed a superkick and a German suplex. Iwatani went up top and hit a moonsault onto Holidead to get the win. Castle ducked some early attacks by King. He frustrated King early and it looked like King was about to bail on the match. However, after the break, King was in the ring getting hit with a few amateur suplexes from Castle. Castle followed up with a bulldog, but King kicked out at two. King rolled to the floor. It looked like Castle was about to fly, but King picked up one of the Boys and pressed him at Castle. He got in the ring and hit the Royal Flush on Castle for the win. King then got on the mic and challenged Scurll to a match at ROH's 17th Anniversary pay-per-view in Las Vegas this Friday. Backstage, Taven was holding his broken title belt and proclaimed that he would show Jay Lethal why he was Matt Taven. Taven then went to the ring and called out Lethal. Lethal came out, but he got jumped by The Kingdom. They tore Lethal’s clothes off and Taven chopped him until Lethal broke free and fought back. But the numbers game got the best of Lethal. Marseglia and O’Ryan hit him with the House of 1,000 Horses and then got a table out from under the ring. Before they could set the table up, Jonathan Gresham ran in and met the same fate as Lethal. They finally set up the table, then Taven hit a giant elbow off the top rope to put Lethal through it. The Kingdom stood strong heading into Friday's Anniversary PPV, where Lethal will defend his ROH World Championship against Taven.